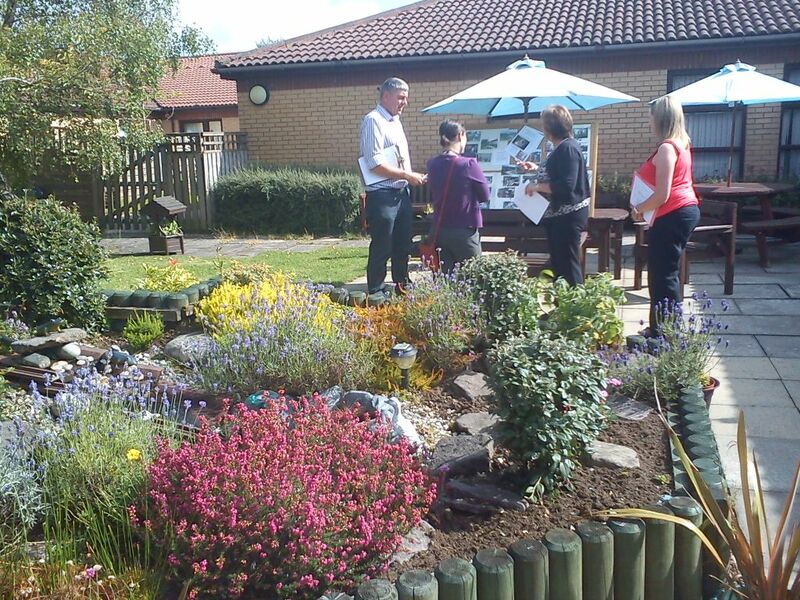 Last Friday, 10th August, saw Cumbernauld judged for this year’s Keep Scotland Beautiful competition. Each year, competing villages, towns, and cities are visited by judges from Beautiful Scotland to assess them against strict criteria which includes Horticultural Achievement, Environmental Responsibility, and Community Participation. Cumbernauld has never achieved higher than a Silver Award but Cumbernauld Environmental Society, taking the lead on co-ordinating the entry, have pulled out all the stops to give our town the best possible chance of winning Gold in the Small City category at this year’s Beautiful Scotland Awards Ceremony, to be held at Motherwell Concert Hall on Tuesday 11th September. Cumbernauld Environmental Society worked with North Lanarkshire Council and a number of local groups to devise the judging route, and also collated and published a ten page portfolio covering Cumbernauld’s horticultural, environmental, and community accomplishments since August 2011. The portfolio received high profile praise recently when it was singled out in a Parliamentary motion at Holyrood by constituency MSP, Jamie Hepburn. On Friday morning, our allocated judges, Gregor McGillivray and Helen Darvill, arrived in Cumbernauld and made their way to Dullatur Golf Club, where they were greeted by Cumbernauld Environmental Society’s Adam Smith, Donna Grant, and John King. After they had settled in, Adam Smith delivered a fifteen minute presentation outlining some of Cumbernauld’s key achievements over the last year, including our Civic Pride Award, the Olympic Torch Relay, and another successful town Gala Day. Following the presentation, the judges boarded a minibus along with Adam Smith and Donna Grant where they embarked on an ambitious tour of Cumbernauld, devised to allow the judges to see the very best of Cumbernauld and to learn about the efforts of dedicated groups and individuals working to make our town a nicer place to live, work, and visit. The judges visited Carrickstone Care Home, Dullatur, Cumbernauld House Park (via Cumbernauld Village), Cumbernauld YMCA/YWCA, Greenfaulds Orchard (via Cumbernauld Town Centre), Watch Us Grow at Palacerigg Country Park, Broadwood Loch (via Condorrat), Cumbernauld Community Park, and Westfield Recycling Centre, before returning to Dullatur Golf Club for a debrief and some light lunch to round off their day; where they were joined by Cumbernauld Environmental Society committee members John King, and Jack Banks, and Chair, Bobby Johnstone. Adam Smith, spokesman for Cumbernauld Environmental Society, said “Beautiful Scotland is a fantastic way of acknowledging and rewarding the time and effort put in by volunteers throughout Cumbernauld in improving our town. While the judges didn’t give anything away, I think Cumbernauld stands a very good chance of being awarded Silver Gilt or Gold, either of which would see our town achieve its highest ever Beautiful Scotland award. We had a great day on Friday, with Cumbernauld basked in sunshine for the duration of the judges’ tour. We can only hope the good weather was a positive sign, but we’ll just have to wait until the award ceremony on Tuesday 11th September to find out for sure”.